Most of my trips to restaurants are simple, but after years of rave reviews from friends and family alike, we scheduled a friend’s birthday dinner at Tao Yuan in Brunswick. The trip north through Friday rush hour traffic was less than pleasant and led to us being 20 minutes late for our reservations, but we made it there safely. Tao is the sister restaurant of a Portland location I’ve previously reviewed and my spidey sense gave me the inclination that the highly regarded restaurant was such for a good reason. Still, I would reserve judgement until after I tried it for myself. There was was quite a crowd in the restaurant when we arrived. As soon as we sat down, it was explained to us that we had the option of ordering from the menu or if – and only if – everyone from the table agreed, we could order the chef’s 15-course tasting menu for $68 each. Much to my dismay, because of the different tastes of the four of us at the table, we immediately decided that ordering from the menu was the right thing to do. Now I had work to do as the waiter suggested three to four plates per person for a full dinner. Before I got to discussing the food with the table, I requested “regular” water and silverware; the already provided sparkling water and chopsticks weren’t my style. With that out of the way, a couple of drinks were ordered including wine and a Hibiscus Swizzle with Goslings Black Seal Rum, Clement VSOP Rhum, Pineapple, Hibiscus, Orange, Mint. The drinks looked great, but I passed as I was driving. We all began to set our sights on food items, many of which used local and organic ingredients in their preparation. We decided we would order for ourselves and also share a bit with others if they were interested. I was fine with that and decided to order one item from each of the four sections of the menu – To Start, Cold, Dim Sum, Hot. After thorough discussion about where we were headed with our meals, we pretty much settled on ordering virtually everything on the menu. I stuck with only four items for myself as planned, but amongst the table we ordered a total of 15 of the 19 menu selections and got doubles of certain ones. It was going to be a party! The waiter informed us that the food would come out as it was ready with the starters and cold items obviously appearing toward the beginning. It seemed like it took forever, but in truth, I don’t think the wait was excessive for our first bits of food; it was probably just that I was ravenous. Asian Slaw – white cabbage, pea pods, carrots, shallots, peanuts and Spicy Greens – purple daikon, white soy dressing, sesame – made their way out first. I tried my spicy greens right away. They were good, but not particularly spicy and I felt the dressing could have been a bit more potent. I tried the Asian slaw and felt that was better. I enjoyed both, but the crunchy slaw had an edge on the more understated greens. Next out for our table were Fried Goat Cheese with mint and Sichuan chili oil and a half dozen Local Oysters with lemongrass mignonette. I avoided the oysters, but was well prepared to try the cheese. Tao Yuan’s unique take on cuisine makes them the only Chinese restaurant at which I ever remember having cheese of any sort. That made it much more interesting to me because I didn’t really know what to expect. The cheese appeared to be pan-fried. I tried it. It was really delicious though I used the house cherry pepper hot sauce to perk it up. That was a solid combination. I also dunked a piece in soy sauce for good measure. The cheese was great any way I had it and definitely unique. The next delivery of food included Yellowfin Tuna Tataki – curry oil, avocado aioli, puffed rice – and Smoked Pork Belly Spring Rolls with apple, hoisin, cilantro, Vietnamese coriander, Thai basil, dynamite sauce along with some white rice. I tried the spring rolls. They were quite tasty with a super shot of pork belly flavor and a look that said “dip me in sauce”. And so I did, starting with sweet hoisin, I took my half spring roll and dipped it, creating a beautiful flavor baby which cried tears of taste. After that, I tried the roll with a dip of the dynamite sauce which was spicy with a vinegar base. It was awesome with a bit of the dynamite bite. Our dim sum was staggered, but we ordered some of each type offered that evening. The daily House Dumplings were of the pork and shrimp variety. Steamed Shao Mai with pork, shrimp, water chestnut, shiitake mushroom was also brought to the table along with Grandma Tang’s Roast Pork Buns – brown bean paste, hoisin, scallions. I tried the shao mai, but shrimp aren’t something with which I am particularly enamoured, so I ate, acknowledged, and moved on to the pork buns which I had ordered. I grabbed one of three buns with some concern about getting my hand slapped. On the outside, they were plump and soft. I sliced one in quarters and took a bite. Heavy on pork and hoisin, the spheres of dough were absolutely outstanding. I could hardly wait to savor the next bites. I tried those with both hot and soy sauces and nothing could reduce the greatness of the buns that Grandma Tang built. I can say with certainty that Grandma Tang has the most delicious buns I have ever eaten. I shared them, but I was hesitant to give away a food that unleashed such a murderous rampage of deliciousness on my taste buds. Coming toward the end of our meal were some veggies starting with Bok Choy flavored with oyster sauce, garlic, and ginger and some Sauteed Brussels Sprouts with bacon, garlic, soy. I tried the Brussels which tasted exactly as expected. They were rife with bacon flavor and infused with serious soy-garlic love. I skipped the bok choy because I was getting close to outgrowing the waist on my pants, though it got rave reviews from the table. My wife got an order of Barley Miso Panko Cod with carrot ginger puree, rainbow carrot salad, garlic confit which she gave the maximum number of stars. Despite offers from my wife to try her cod, I passed in favor of waiting for my Pan Seared Scallop with black garlic, apple, preserved Meyer lemon, tarragon, sunshine squash. A couple bites proved the scallops were great, but the light, buttery whip of squash took the plate to another level. 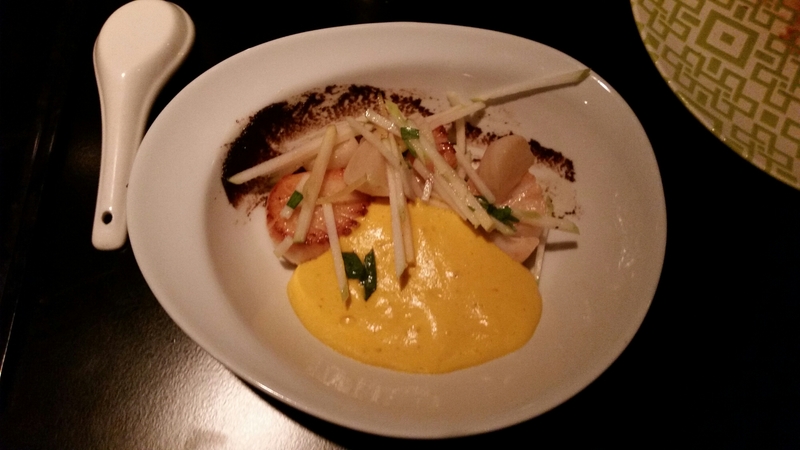 With sticks of apple adding a crunch, the scallops were a shining light in an already bright sky of food. I ate relentlessly and savored each bite as though it might be my last. Of course, eventually one was my last, but it was a slight disappointment because I wanted more. Pulling up the rear of our food was a plate of Pan Seared Duck Breast with parsley root, golden raisin, apple chutney, and jus. While I’m neutral on my thoughts of duck, I decided to try a slice of the quacker. It was much better than I anticipated. The accoutrements were well played with the sweet, fruity flavors pairing quite well with the tender bird. We all shared bits of the duck and agreed that desert was an unlikely finale after the incredible conglomeration of food we consumed. Post dessert menu viewing, we reaffirmed our stance. Add Tao Yuan to the list of amazing restaurants I’ve visited lately. The food is great and the prices are fair. The plates average about 10 bucks apiece. Our total of $243 before tip included five drinks and plenty of food for four hungry people; food for the next day’s lunch even went home with one of our party. For a restaurant that considers itself a Chinese eatery, they are definitely creating food that is outside the box and there isn’t anything wrong with that. By the time we left, the place was packed and with good reason. I’d bet a serious sum of money that many people were there to taste Grandma Tang’s buns, but even if you don’t like the way those things shake, there’s much more to love about the popular Brunswick location. Go there now and procure some food. And if you trust me, go ahead an order multiple Grandma Tang buns. Next time I go there’ll be enough buns at my table for a bikini contest. This entry was posted in Portland, ME food on November 9, 2015 by peterpeterportlandeater.